Ever since I was a little kid when my dad taught me how to play, I have been a fan of Chess. When I stumbled across this book and read the paperback edition’s back cover, I knew I had to read it! The world of Chess takes center stage in this excellent thriller. Two women centuries apart undertake a dangerous task: to protect the chess set once owned by Charlemagne, a set that confers greatness and more upon those who possess it. An historical and modern suspense thriller all in one! Katherine Neville’s debut novel begins in 1790 France–the country ablaze with revolution–at Montglane Abbey. Two young novices, Mireille and Valentine, are tasked with a monumental task. They must scatter the pieces of a chess service and keep the secret from French revolutionaries who would abuse its power. Chapter Two shifts to 1972 New Year’s Eve in New York. We are introduced to Catherine Velis, a gifted mathematician and CPA; her accounting firm has given her an assignment that will take her to Algeria. In the following chapter, Cat is given the start of an additional quest: to locate a missing chess piece in Algiers. It is the start of an adventure to rival any Dan Brown thriller. I recall reading this paperback in the summer of 1989, a year after its publication. At the time, it quickly became one of my favorite books. An author I was sure to read again. Though unfortunately I have yet to do so. It didn’t help that the author’s second novel didn’t appear until three years later, and by then, I had moved on, reading other novels and keeping up with other series. Recently, I’ve replaced my original paperback with a newer trade copy (with an awesome cover design). This is one book I would consider reading again. And there’s a sequel! 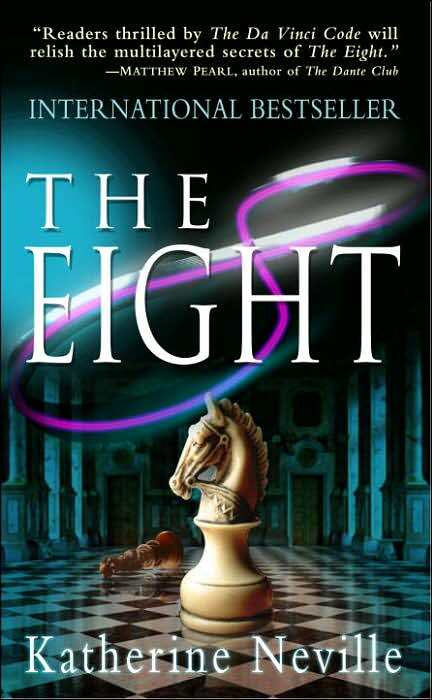 In 2008, twenty years after the publication of The Eight, a sequel novel, The Fire, was released. Although I’ve heard this next chapter in the saga, focusing on Cat’s daughter and paralleling the structure of its predecessor, was not nearly as successful. Reviews were middling. For more on Katherine Neville and her novels, visit her website here.